(graft), Do not confuse this word with graph. 1. Any tissue or organ for transplantation. See also: flap, implant, transplant. 2. To transplant such structures. 2. to implant or transplant such tissues. See also implant. accordion graft a full-thickness graft in which slits have been made so that it may be stretched to cover a larger area. arteriovenous graft an arteriovenous fistula consisting of a venous autograft or xenograft or a synthetic tube grafted onto the artery and vein. Blair-Brown graft a split-skin graft of intermediate thickness. bone graft a piece of bone used to take the place of a removed bone or bony defect. delayed graft a skin graft sutured back into its bed and subsequently shifted to a new recipient site. dermal graft , dermic graft skin from which epidermis and subcutaneous fat have been removed; used instead of fascia in various plastic procedures. fascia graft one taken from the fascia lata or the lumbar fascia. heterologous graft , heteroplastic graft xenograft. homologous graft , homoplastic graft allograft. isogeneic graft , isologous graft, isoplastic graft syngraft. nerve graft replacement of an area of defective nerve with a segment from a sound one. omental grafts free or attached segments of omentum used to cover suture lines following gastrointestinal or colonic surgery. pedicle graft see under flap. pinch graft a piece of skin graft about 14 inch in diameter, obtained by elevating the skin with a needle and slicing it off with a knife. split-skin graft a skin graft consisting of only a portion of the skin thickness. 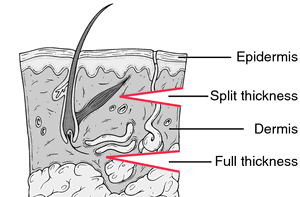 thick-split graft a skin graft cut in pieces, often including about two thirds of the full thickness of the skin. To transplant or implant (living tissue, for example) surgically into a bodily part to replace a damaged part or compensate for a defect. 1. To make a graft. 2. To be or become joined. a. Material, especially living tissue or an organ, surgically attached to or inserted into a bodily part to replace a damaged part or compensate for a defect. b. The procedure of implanting or transplanting such material. c. The configuration or condition resulting from such a procedure. a tissue or an organ taken from a site or a person and inserted into a new site or person, performed to repair a defect in structure. The graft may be temporary, such as an emergency skin transplant for extensive burns, or permanent with the grafted tissue growing to become a part of the body. Skin, bone, cartilage, blood vessel, nerve, muscle, cornea, and whole organs, such as the kidney or the heart, may be grafted. Preoperative care focuses on a high-protein diet and vitamins to ensure optimal physical condition and on freedom from infection. With the patient under general or local anesthesia, the tissue is transferred and sutured into place. Rejection of a non-autograft is the major complication: fever, pain in the graft area, and evidence of loss of function 4 to 15 days after the procedure are indicative of rejection. Immunosuppressive drugs are given in large doses to suppress antibody production and rejection. Even if an early reaction is prevented, late rejection may occur 1 year or more after the graft is done. Also called transplant. See also allograft, autograft, isograft, skin graft, xenograft. Immunology Any tissue taken from one part of the body of the same or different person and used to replace diseased or injured tissue in another part of the body. See Allograft, Bone graft, Bypass graft, Corneal graft, Coronary artery bypass graft, Dermagraft, Endovascular stent graft, Endoscopic coronary artery bypass graft, Fetal brain graft, Hair graft, Hemi-homograft, Hemobahn endovascular graft, Irradiated chondral graft, Isograft, Micrograft, Minigraft, Skin graft, Split thickness graft, Standard hair graft, Strip graft, Test graft, Tissue graft, White graft. 1. Any free (unattached) tissue or organ for transplantation. A tissue or organ, taken from another part of the body or from another donor person, and surgically implanted to make up a deficit or to replace a defective part. To be successfully retained, a graft must quickly establish an adequate blood supply and must be able to resist immunological rejection responses. the transfer of a small part of an organism to a relatively larger part where it is transplanted. This may take place from one part of an organism to another part (see AUTOGRAFT), or from one organism to another (see ISOGRAFT, HOMOGRAFT, HETEROGRAFT). Many embryological studies have involved grafting, and from a medical point of view, skin grafting, particularly after serious burns, is commonplace. Organ grafts such as heart transplants are now much more common, though rejection by an animal of the tissues of another is still a serious problem (see IMMUNE RESPONSE). In animals the graft comes from a ‘donor’ and is transferred to the recipient. In plants, grafts are used often in horticulture, where a scion, the plant to be cultivated, is attached onto a STOCK (1), the rooting portion. To implant living tissue surgically. In coronary artery bypass graft surgery, healthy veins or arteries are grafted to coronary arteries. n a slip or portion of tissue used for implantation. See also donor site; recipient site. n a graft between genetically dissimilar members of the same species. n a graft using tissue from the same species (i.e., person to person). See also allograft. n a graft of an inert metal or plastic material. n a graft taken from one portion of an individual's body and implanted into another portion of the individual's body. n the bone that is removed from one area of a patient's body and transplanted into another area that requires additional bony material. Such bone grafts are advantageous because they contain live active cells that promote bone growth. n the transplantation of healthy bone tissue to a defective bone cavity so that the new bone tissue meets the surrounding, unaffected surface and promotes healing and new growth. n a transplant involving living tissue made of different materials, such as skin and cartilage. n the site from which graft material is taken. n the filling of defects, such as bone chips used to fill a cyst. n a graft of tissue completely detached from its original site and blood supply. n a skin graft consisting of the full thickness of the skin with none of the subcutaneous tissues. n a graft in which a thin piece of tissue is taken from the palate of the oral cavity, or moved over from adjacent areas, to provide a stable band of soft tissue around a tooth or implant. n a graft implanted from one species to another. n a graft taken from a member of a species and implanted into the body of a member of the same species. n a bone graft whose donor site is the crest of the ilium. Various locations of the iliac crest duplicate areas of the mandible and curvatures of the midfacial skeleton. n a graft between individuals with identical or histocompatible antigens. n a denatured calf bone used to fill defects or restore facial contour. n a split-thickness graft involving the mucosa. n a graft in which the grafted bone is applied laterally to the cortical bone of the recipient site, frequently to improve the contours of the chin or the malar eminence of the zygomatic bone. n a surgical tissue implant or graft consisting of various particles, e.g., used in the stimulation of bone growth. n a stem or tube of tissue that remains attached near the donor site to nourish the graft during advancement of a skin graft. n the surgically removed bone taken from the ascending ramus of the mandible for the purpose of transplantation. n a graft with varying thickness containing only mucosal elements and no subcutaneous tissue. contiguous transplant, which involves a greenstick fracture of bone bordering on an infrabony defect and the displacement of bone to eliminate the osseous defect. n.pr a split-thickness skin graft containing cutaneous and some subcutaneous tissues, the line of cleavage through the rete peg layer. 2. to implant or transplant such tissue. See also flap (1), grafting, allograft, xenograft. 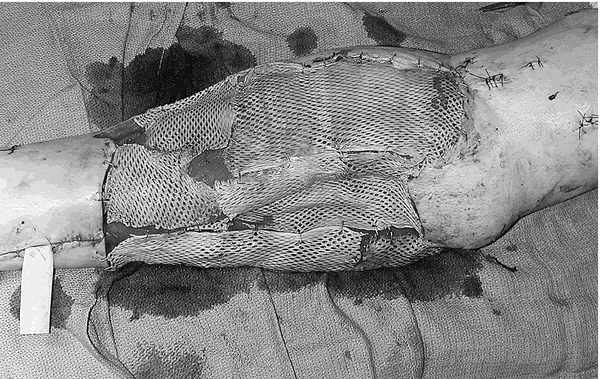 a skin graft taken from the patient's own body. a graft taken from another area of the patient's own body; an autograft. a graft of tissue in which not even transient vascularization is achieved. site to which a graft is to be joined. the transfer of living bone, usually for fracture repair or reconstructive surgery. Various types of bone grafts are identified, depending on their source and treatment, if any, e.g. cortical, autograft, allograft, cancellous, xenograft, isograft. a nerve graft made up of several sections of nerve in the manner of a cable. skin from which epidermis and subcutaneous fat have been removed, used instead of fascia in various plastic procedures. prior exposure of the recipient to the donor's tissues may prolong survival of a graft. a piece of epidermis implanted on a raw surface. a graft of tissue taken from the external investing fascia of the leg (fascia lata). a nerve graft in which bundles of nerve fibers are approximated and sutured separately. a graft of tissue completely freed from its bed, in contrast to a flap. a skin graft consisting of the full thickness of the skin, with little or none of the subcutaneous tissue. a graft of tissue transplanted between animals of different species; a heterograft or xenograft. a graft of tissue obtained from the body of another animal of the same species but with a genotype differing from that of the recipient; a homograft or allograft. a graft of tissue transplanted between genetically identical individuals; an isograft. replacement of the superficial layers of an opaque cornea by a thin layer of clear cornea from a donor eye. skin grafts in which multiple small incisions have been made to permit lateral stretching of the graft and to increase flexibility to facilitate placement in tricky sites. free or attached segments of omentum used to cover suture lines following gastrointestinal or colonic surgery. used in the surgical repair of tissue defects of the esophagus and to enlarge the pulmonary outflow tract. In-lay patches replace missing tissue. On-lay patches reinforce existing tissue. a portion of skin and subcutaneous tissue with a vascular attachment moved from one part of the body to another. Grafted to the new site, they not only can survive because of their own vascular supply, they can improve circulation in the site. Called also pedicle flap. a piece of periosteum to cover a denuded bone. 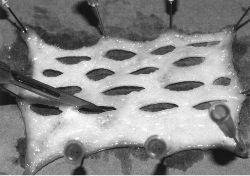 a piece of skin graft about 6 mm in diameter, obtained by elevating the skin with a needle and slicing it off with a knife. grafts are obtained by using a skin biopsy punch on the animal or on a piece of separated skin. small pieces of skin are imbedded in granulation tissue on the same patient. a skin graft from which tiny circular islands of skin are removed so that a larger denuded area can be covered, the sievelike portion being placed over one area, and the individual islands over surrounding or other denuded areas. a piece of skin implanted to replace a lost part of the integument. Many types of graft are used and are included in this list. a skin graft consisting of only a portion of the skin thickness. a bit of sponge inserted into a wound to promote the formation of granulations. squares of split-thickness or full-thickness skin are placed on a bed of granulation tissue. a skin graft cut in pieces, often including about two-thirds of the full thickness of the skin. We report an unusual graft complication, a pseudointimal graft dissection in a patient after repair of coarctation of the aorta. The Williams/EMC combination also exhibited "located" incompatibility according to the macroscopic anatomical evaluation of the graft union region. Cannulate at least 3 inches away from the connector incision site to avoid injury to graft rings. The bark graft is my favorite graft for tree makeovers because it comes with the largest insurance policy. Full thickness skin grafts from the groin: donor site morbidity and graft survival rate from 50 cases. 2010) compared the whip-and-tongue and cleft grafting methods, in August, they observed lower graft survival for jabuticabeira Sabara when cleft grafting was performed. After shaping, graft placed on dome of lower lateral cartilage and secured in place by 5-0 PDS suture. f) Any kind of graft requires deceiving society and cheating people. It is possible that a proximally occluded sequential vein graft will function as a large collateral vessel, provided that the terminal anastomosis is connected to a large coronary vessel with high blood flow. Finally, I believe that a meticulous method to assess intraoperative graft patency increases the accuracy of diagnosing technical problems and improves surgical outcomes. The extended dorsal-shield graft provides excellent dorsal augmentation and projection, and it circumvents the possibility of scarring and cartilage warping that can occur with multiple individual grafts. Because the graft was highly porous, cells were easily able to penetrate the graft wall, and mononuclear cells occupied many of the pores within three days.